Nothing makes a country famous better than athletics." This quote from President Islam Karimov became the slogan of the republican youth Olympics Barkamol Avlod'2008 [Healthy Generation] opening May 17 in Nukus near the Aral Sea. 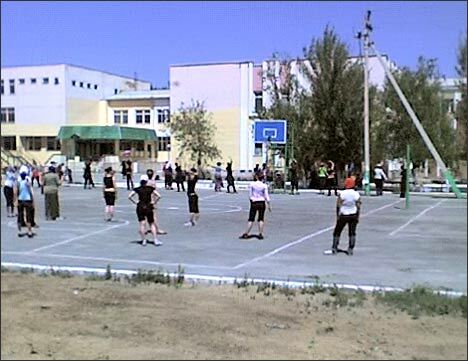 Barkamol Avlod’s official web site boasts that athletes from lyceums and colleges all over Uzbekistan are coming for the three-phase tournament in Nukus. The Olympics are being sponsored by the President. The city and the autonomous republic are being readied for the forthcoming event. "Turon stadium, the site of the solemn opening ceremony, was reconstructed in Nukus. Reconstruction cost the budget 1.1 billion sums which included artificial grass, 12,000 new seats, dressing rooms, rest rooms, and shower stalls," UzA news agency reported. Nobody heeds the downtrodden population or cares about zealous civil servants. "That's a crash effort really, involving a great deal of students, menial workers, and even prisoners," said Karakalpakstan resident Bakhrom, using an alias, in an interview with Ferghana.Ru. "I hear that students and employees of some budget organizations "volunteered" to donate 20,000 sums each from their March scholarships and salaries to the forthcoming Olympics budget. People are working without a break, seven days a week. Who needs it?" There is no saying how much the Uzbek budget allotted for the Olympics, but the sum turned out to be inadequate. Some state officials were sacked for pilfering, others for arguing with superiors. Ferghana.Ru sources say that Prime Minister Mirziayev visited Nukus in person. "Sure, some heads did roll," Bakhrom said. "Mirziayev sacked the Nukus khokim and the Karakalpakstan minister of health care. I hear that this latter turned down the advice to order all doctors and nurses to donate to the Barkamol Avlod budget. It cost him." Nukus, the capital of Karakalpakstan, is located in the Aral ecological catastrophe zone. Living standards there are probably the lowest in Uzbekistan. For instance, a doctor in a state hospital is paid approximately 120,000 sums, about $86. Prices, in the meantime, creep up, leaving salaries inevitably behind and keeping the population in poverty. The sports event is being organized in an impoverished city. "Instead of arranging the Olympics or whatever, the authorities would have done better to pay attention to the condition of the local population! 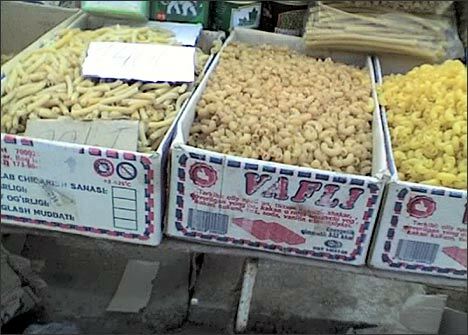 Unemployment, food prices soaring sky-high well above predictions! 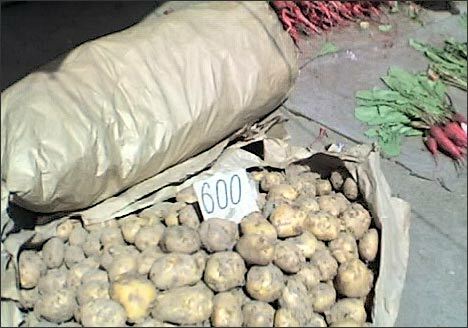 Rice goes at 2,000 sums (approximately $1.4 against 700 sums last July); tomatoes at 2,200 sums (almost $1.6), potatoes at 600 sums ($0.4)," Bakhrom said. "The quality of running water is appalling, streets are dirty... Bread at 250 sums a loaf is absent from all stores but easily available at bazaars for twice the sum!" 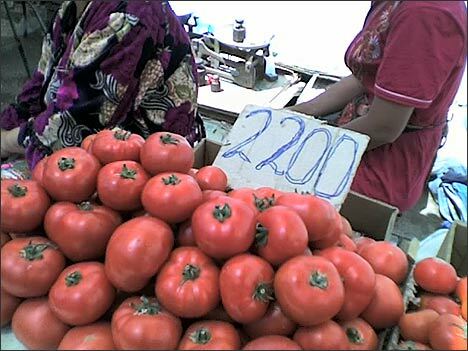 Ferghana.Ru previously reported on shortages of bread in Karakalpakstan last November. Sources contacted Ferghana.Ru several days later to say bread was again available, but soon became scarce again. 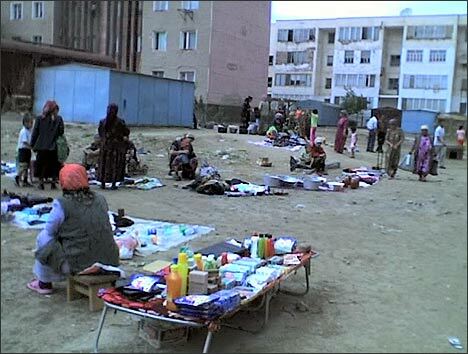 Residents are becoming accustomed to food shortages and say that they will manage as long as young athletes coming to Nukus have enough to eat.